Check Availability Start Planning Now! This 40ft Obstacle Course II offers amazing fun while 2 opponents race through the obstacle passing over pop ups, barrel rolls, climbing walls and more to see who will finish the course as the winner! 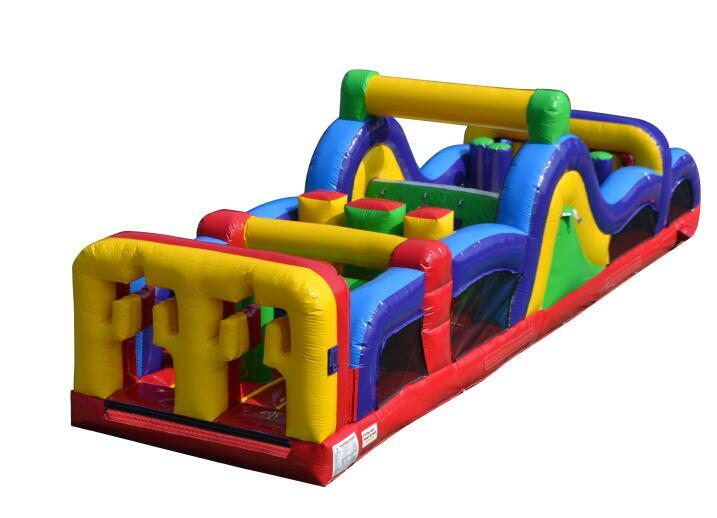 This is a great obstacle course rental for those who are having events where you have a lot of particiapants. It works great because it offers this race component where participants want to move through quickly to be the winner which ends up keeping your line flowing and moving very quickly. The attendant can easily manage/monitor this unit by doing a quick ready, set, go sequence to get particpants feeling the race vibe from the very start...asking them to let you know who won on their way out ensures you quickly see them when they are out so you can send the next 2 opponents into the obstacle. Offering a safe and fun activity for just about any type of event from a backyard party, to high school graduation, post prom event, mayday, fair, festival, church event, and so much more! Enjoy this rental conveniently available in York, Lancaster, Harrisburg, and surrounding counties. We even service counties in Baltimore County! Create your most adventorous event yet...invite 3 Monkeys Inflatables to your party to ensure you have the best and your guests leaving saying "Best Party Ever!". Outlets: 1 110 volt GFCI outlets 10 amps, within 100 feet of the unit. Generator Rentals are available. Attendants/Monitors: This item requires (1) Attendant to stay with the unit while in use. You may use your own attendant, or book an attendant with us here . Read more about attendants here. 2. We cannot setup under any utility lines and must have a clearance of 5 feet in all directions away from any obstacles. Extension Cords (we bring out the extensions needed to get electric to the spot you are setting up in) Keep in mind we can only go 100 ft max.